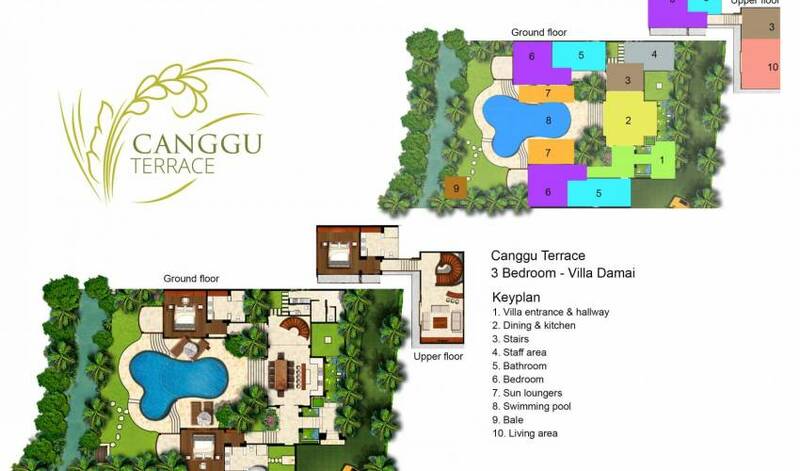 Canggu Terrace comprises three contemporary-styled, two- and three-bedroom villas positioned side by side with a glorious view of the rice terraces. 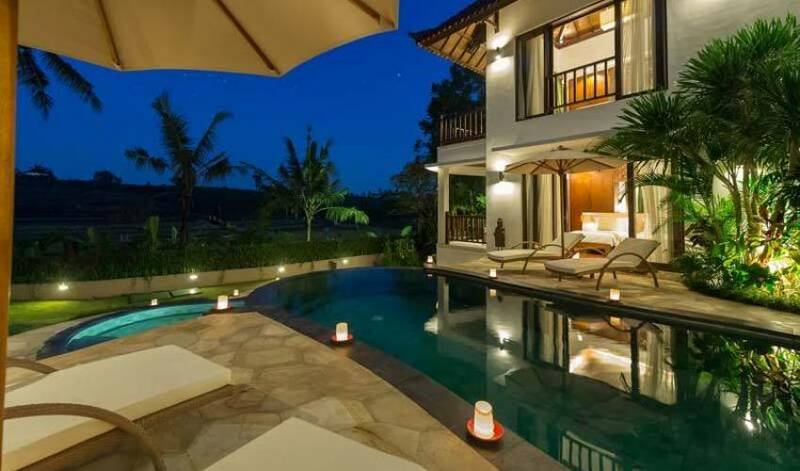 Each villa is characterised by comfortable furnishings, gorgeous artwork and antiques, a swimming pool and a children’s pool, plus the inclusive services of personal butlers, a security team and a superb chef. 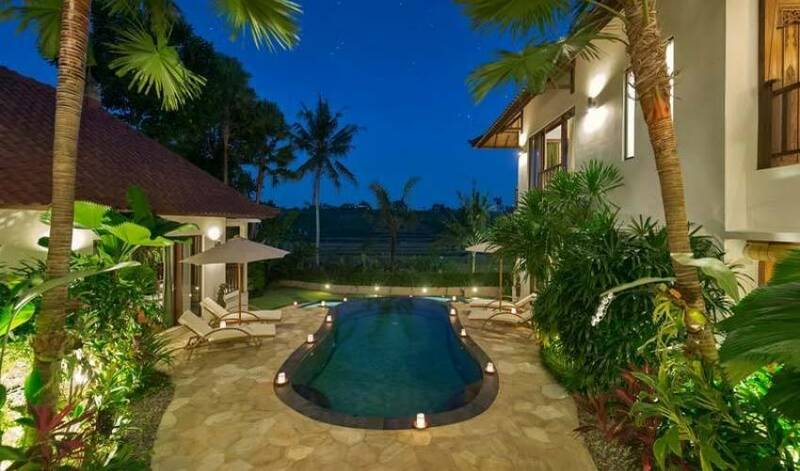 Located in a tranquil village in south-west Bali, just six kilometres from the beach, ten kilometres from the golf course, and ten kilometres from fashionable Seminyak, all three villas can be rented independently or together, offering families and groups of friends the choice of a two, three, five, six or eight-bedroom renting option. 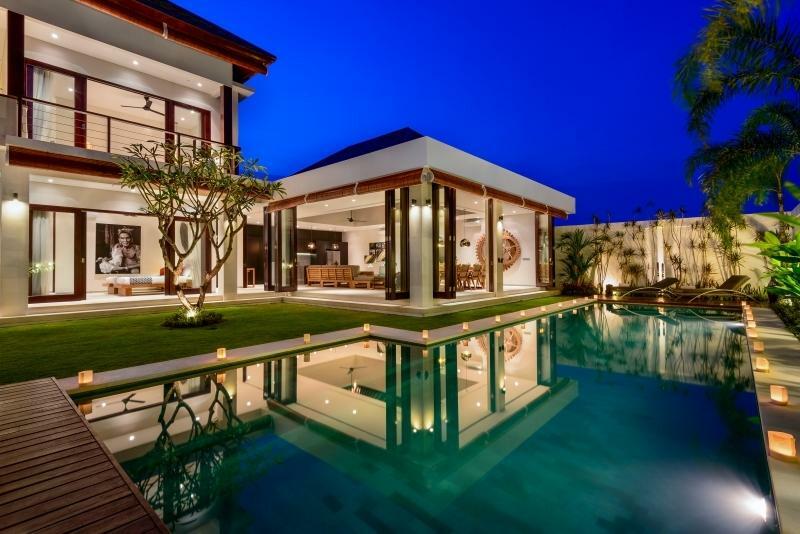 Villa Damai at Canggu Terrace is a contemporary paradise overlooking the rice fields and offering nothing but the highest levels of service combined with all the peace and serenity for which Bali is renowned. 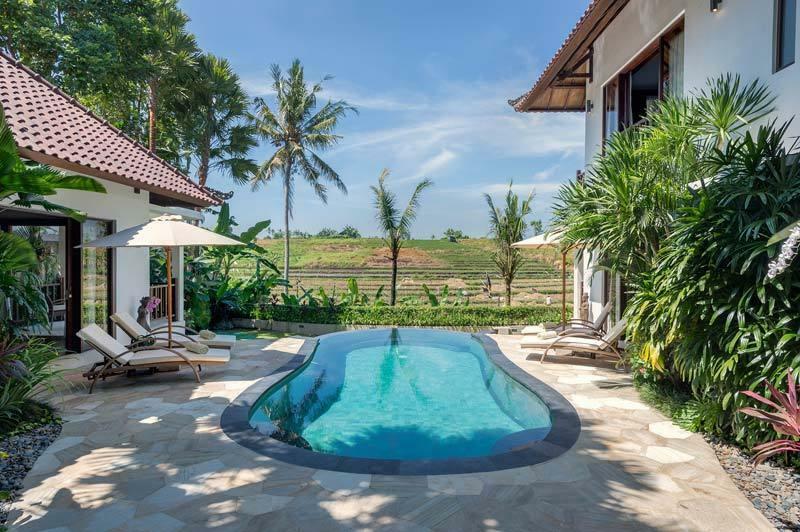 The villa’s three bedrooms are ideally positioned to look out over the pool and neighbouring rice fields, each with a private terrace or balcony, which makes rising from your super comfortable queen-size bed each morning an act of pure delight. All bedrooms have large ensuite bathrooms, and the master bathroom has an additional outdoor shower, representing the true essence of tropical bathing to make the start to your day even more special. 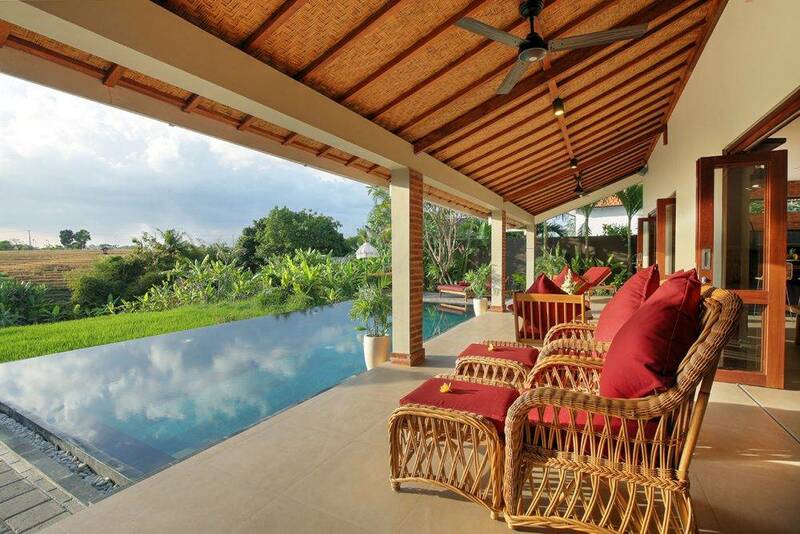 The villa is one of three luxury villas that make up the villa estate. 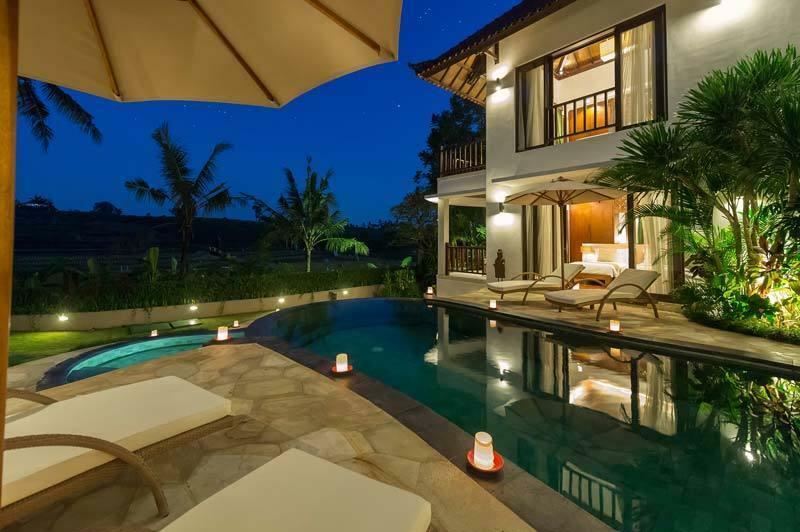 Our versatility is such that we can offer you a combination of two, three, five, six or eight-bedrooms, making us an ideal choice for anything from a honeymooning couple to a grand gathering of up to 16 guests. 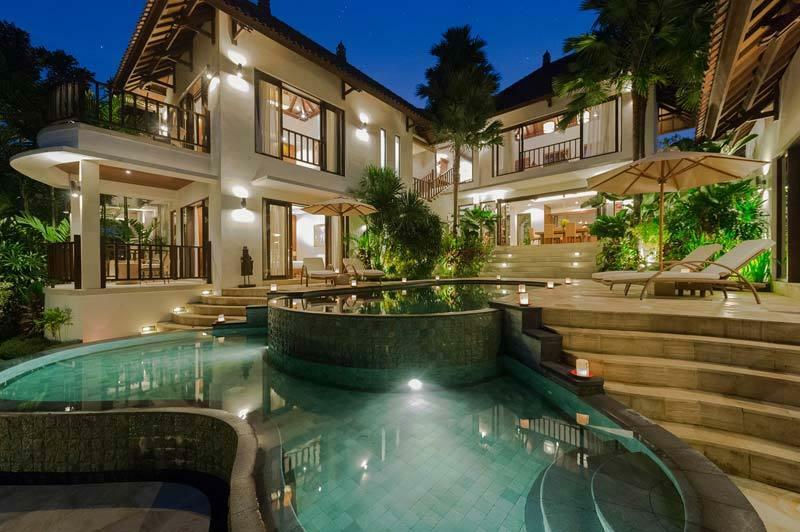 Heralded by fishponds, the two-storey, three-bedroomed villa is entered via the dining room, where an integrated kitchen lies to one side. A staircase spirals up to the living room and, from here, a few steps descend to a covered walkway leading to the upper floor guestroom. Back downstairs, covered walkways on either side of the dining room give access to the two ground floor bedrooms, which flank a stone deck surrounding a free-form, eight-metre swimming pool that overflows into a shallow kids’ pool on the lower level. 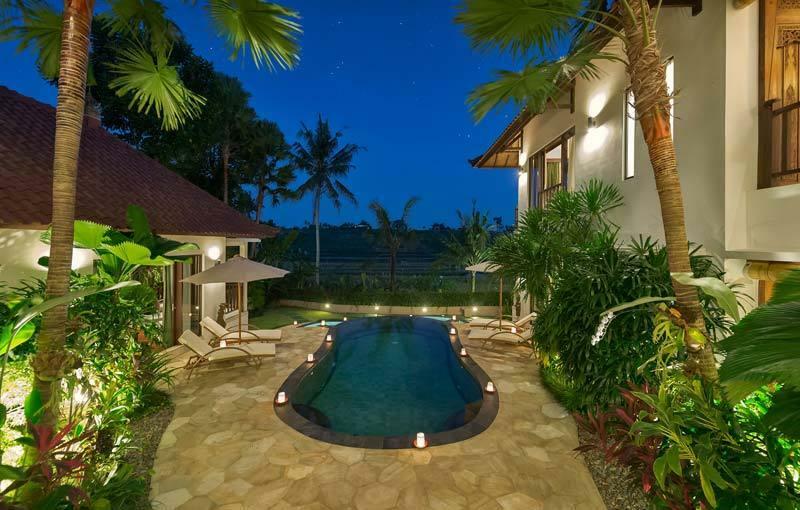 A small lawn extends to a hedge with a river below and luxuriant rice terraces beyond. 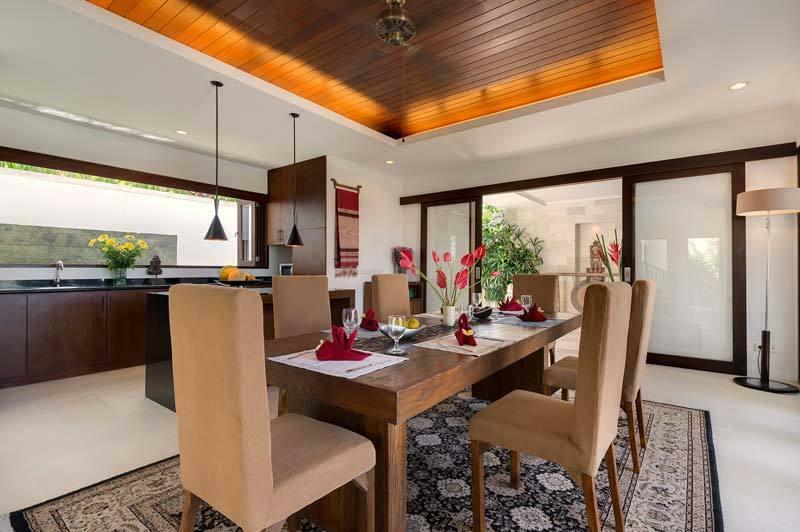 In the tropical-styled dining room, guests can relish the chef’s delicious meals at a carved wooden table for six, which is cooled by the natural breezes that flow through two sets of sliding doors leading out to the pool deck. An integrated kitchen rests to one side for guest use, equipped with a gas hob and microwave. 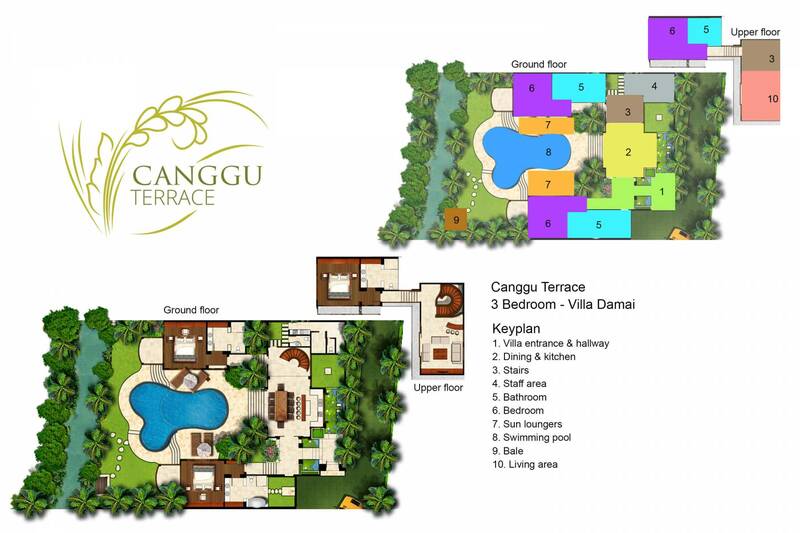 The chef’s kitchen (serving all three villas) is situated out of sight. An impressive staircase spirals up to the villa’s air-conditioned living room, set below a vaulted timber roof. 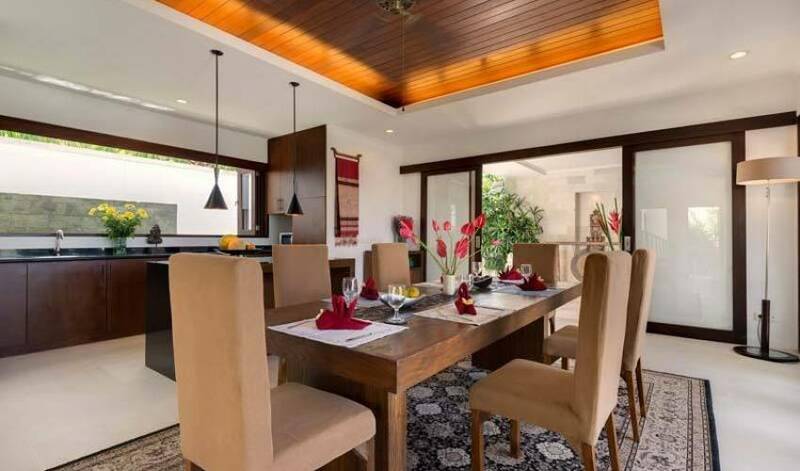 Equipped with a 42-inch satellite-channel TV, DVD player, iPod dock, and Bose audio system, and furnished with a large sofa and an antique book cabinet, the room showcases some decorative Indonesian songet textiles framed under glass. A precious feature is the wall of glass that opens to the awesome rice-field view. 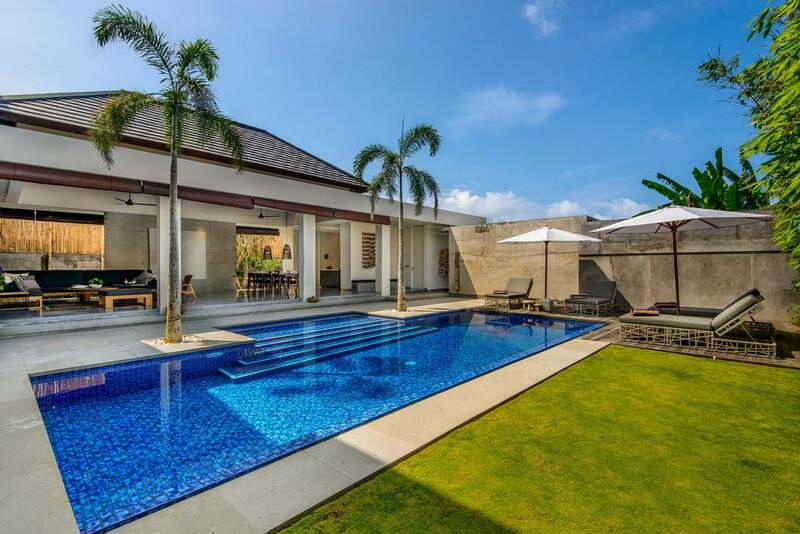 A stone deck, surrounds Villa Damai’s free-form, eight-metre swimming pool, which overflows into a shallow pool on the lower level – perfect for kids. Corners of the neatly landscaped garden are filled with palms, ferns, and beautiful orchids, while a small lawn on the lower level provides the perfect spot for a barbecue, prepared and served by the staff, against the backdrop of a river below and the rice-fields beyond. Accessed via an intricately carved door, and adorned with dazzling tactile artwork, the master suite is furnished with a queen-size bed from which guests can enjoy watching TV and movies. The bedroom and its sun terrace look out over the pool and mesmerising rice-field vista just beyond. The air-conditioned bathroom is fitted with a freestanding bathtub and a walk-in rain shower. Cage-like lampshades cast interesting shadows and an exotic outdoor shower, where water pours from a terracotta pot, is set within a private courtyard under a pergola roof draped in flowering climbers. Each air-conditioned guest suite – one downstairs and one upstairs – is adorned with dazzling, tactile artwork; one is furnished with a queen-size bed and the other with twin beds that convert to a king. Here, guests can watch TV and movies from their bed, and enjoy the mesmerising vista of the rice terraces, especially when viewed from each private stone-floored balcony/terrace. Both air-conditioned bathrooms are fitted with walk-in rain showers. 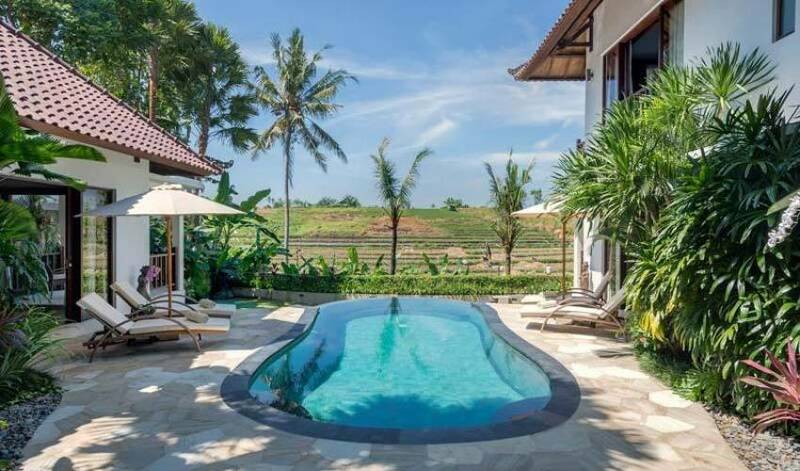 Canggu Terrace is situated in a rural location surrounded by rice fields and traditional Balinese villages, and you can watch the world and the rice harvest go by from the privacy of your bedroom terrace or the cool depths of the swimming pool. There are no shops, bars or restaurants in the immediate vicinity apart from a couple of warungs (local cafés) selling cold drinks, cigarettes and snacks. That said, the villa offers a wonderful opportunity to wander through the rice fields and the village to experience a slice of local life.